"A lot of mislocated pitches and they took advantage of all of them," said Maeda. "My sliders didn't break as much as I'd hoped. I was trying to stop the losing streak, but unfortunately it didn't work out that way. I didn't execute and I didn't perform." This Day in Dodgers History: In 1890 the Brooklyn Bridegrooms (Dodgers) and the Pittsburgh Alleghenys (Pirates) play the first ever Triple-Header. Brooklyn sweep Pittsburgh -- 10-9; 3-2; 8-4. Bob Caruthers, Tom Lovett and Adonis Terry all pitch complete games In 1941 Dodger first baseman Dolph Camilli hit his 200th career home run. He would eventually earn NL MVP honors at the end of the season. In 1969 Willie Davis tied a franchise record (Zack Wheat in 1916) by hitting in 29 concecutive games. Happy Birthday, Darby O'Brien & Luis Lopez! ICYMI: Rosters expand today to allow teams to bring up both prospects for a cup of coffee and needed depth for a playoff run. Both Alex Verdugo and Wilmer Font will be called up to Los Angeles, per Rowan Kaver at Dodger Insider. BTW, Wilmer Font was named the PCL Pitcher of the year yesterday, per Eric Stephen at True Blue LA. Font, 27, was signed by the Dodgers to a minor league deal last offseason. The right-hander is 10-8 with a 3.42 ERA in 25 starts in Triple-A, with 178 strikeouts and 35 walks in 134⅓ innings. He leads the PCL in ERA, WHIP (1.109) and strikeouts. Per Ken Gurnick at MLB.com; "Seager not ready to resume throwing: Dodgers shortstop won't be back in lineup until late next week at the earliest." 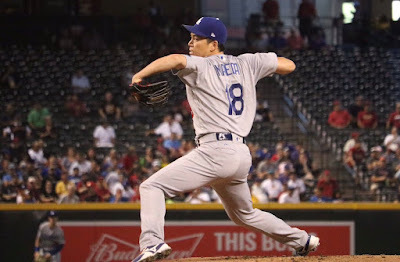 Roberts said the club shut down Seager because "any time you have acute pain, sometimes subconsciously you try to manipulate the motion to not hurt it. We're trying to get ahead of it and not compromise himself and and put himself in harm's way. That's what we're trying to do." Via Harold Uhlman at Think Blue LA; "Raptors Romer Cuadrado leading play-off charge." Perhaps the hottest hitter currently in the Dodgers minor league system, Cuadrado has 24 hits in his last 13 games during the Raptors stretch drive. His hit total includes four doubles, two triples and three home runs. He has driven in 17 runs and scored 21 times. During those 13 games, he is hitting at a Ted Williams .406 clip. Welcome to the Blue, O’Koyea Dickson! Welcome to the Blue, Alex Verdugo!